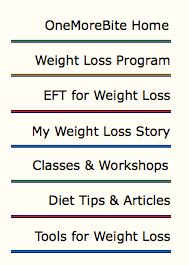 The One More Bite online weight loss workshop includes eight separate sessions, each lesson building upon the last. As you complete each week your issues begin to shift and change in ways you may not have thought possible. By the end of the series you'll have the knowledge and experience to carry you through until you reach your goals. Throughout the course you may e-mail me at any time with questions and I'll reply with specific ideas for dealing with your issues. If you know you have very specific issues you want to address, schedule private sessions. There is so much more to weight loss than just eating. It's about the emotions that drive us to eat, and the reasons we can't get ourselves to follow through with our plans. Private sessions are for you when you're ready to tackle your issues head-on. Consider how much money you have spent over the years for diet plans, pills, or workshops but you're still looking for the answer. What if you could finally find a way to end that struggle and move forward with your life? That is what private sessions can help you achieve. Together, we develop a plan that works for you and that you'll be able to use from this point forward in making any changes you desire. This approach is simply not effective, for as soon as you return to your usual eating patterns, any pounds lost will quickly return and that money is down the drain. You don't need a food list, you need a way to get past your obstacles, and here is that way. Working with your own private weight loss coach gives you the skills and tools to use for the rest Register now for the 8-week online ending emotional eating with EFT & NLP course of your life. This is not a cookie cutter approach, or one-size-fits-all diet plan, but a self-designed plan, together with exercise to reduce or eliminate those emotional issues that have been causing you to overeat for years. You can be located anywhere in the world and still attend. You will receive the same materials and handouts as if you attended in person. Studies have proven that having a support network is more effective for long-term weight loss. Having your own weight loss coach provides a built-in network and working with a group adds more variation with the input of the group members. Our group sessions are built around teaching new techniques each week, focusing on specific goals common to the group and more. No matter what you choose, you'll look forward to our time together. Workshops are a great opportunity to meet the group leader, Kathryn, and speak with other like-minded individuals going through the same experiences as you. You will learn hands-on to perform the EFT techniques on yourself while practicing on your own and other's issues. You'll experience the phenomena called "borrowing benefits." As you watch and participate along with the demonstrations, you'll benefit from the exercise on your own issues. (Borrowing Benefits also is explained and used in the tele-seminar). I guarantee you will be thrilled with the experience and techniques you learn or I will gladly refund your money. Nothing works for everyone. There is nothing to lose, everything to gain. You'll be smiling and laughing at the end of the workshop because this is so simple and effective.